Fishery Location: Trawl Ground 3 and 4 in map below: Fishing vessels over 90CV, considered “offshore vessels,” can freely fish in offshore waters, but operate mainly in the southeast (3) and southwest (4) areas. FIP Contact: If you would like more information about the FIP or wish to support the FIP, please contact SFP. Sustainability Information: There are no formal evaluations of the trawl fisheries of Ben Tre. One is being planned for the near future. A description of trawl fisheries in Vietnam, including information specific to Ben Tre Province, can be found here. Maintain a watching brief on international developments in issues such as certification and labeling. Ask their suppliers to provide information about which species are used in the feed fed to farmed shrimp (and other species). Ben Tre Province is in the Mekong Delta region of southeastern Vietnam. Its shallow, tropical waters support a wide diversity of fish and shellfish and a thriving fishing industry that supplies both local needs and products for export. 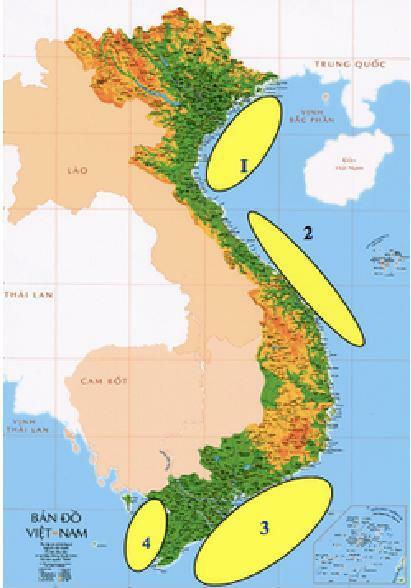 The map in the Fishery Location section, above, shows Trawl Ground 3, which is adjacent to Ben Tre and neighboring provinces. Catches from the trawling sector are significant sources of seafood in Vietnam in general, and southern Vietnam in particular. In 2014, about 2,700 trawlers operated in Ben Tre Province, ranging in size from <20 horsepower (hp) up to >400 hp, about 45% of which were less than 90 hp. Unofficially, there are currently more than 2,000 units of small trawlers (below 30CV) operating this makes total number of trawlers and fishing efforts of this fishery large than the official report from Sub-DECAFIREP. There are two main types of trawl fishing – demersal trawling, whereby the net is towed along the seabed, and height opening trawlers, whereby the net is towed through the water column. Demersal trawls are used to catch invertebrates such as octopus, shrimp, and bottom-dwelling fish, while height opening trawlers catch all types of fish available in the water column from seabed to the surface. Some pair trawlers operate in the nearshore waters (about 20–40m depth). These trawlers have very big mesh size at the winches (100–200cm) and a highly vertical opening; they are actually bottom trawlers, but catch mainly pelagic fish species (anchovy, sardine, scad, carangid) and, therefore, are not mid-water trawlers. Mid-water trawlers are single (otter) trawlers, not pair trawlers, and are very popular in countries including Norway, Denmark, and Iceland. In 2007–2010, a DANIDA-funded project implemented a study that created a list of the over 2,000 species of fish and shellfish caught in Vietnam by gear type and by province in which they were caught (Tran Dinh 2008). The primary families of fish caught include lizardfishes, croakers, goatfishes, threadfins, bigeye snappers, porgies, snappers, groupers, sardines, mackerels, and scads. Invertebrates are dominated by shrimps, squids, cuttlefishes, and octopuses. The catches comprise species of a variety of sizes, some of which are suited for direct human consumption. Others are processed into a variety of products such as fish sauces and surimi, and the rest is used to produce fishmeal to feed the burgeoning aquaculture industry and livestock. There are concerns in this region, as are warranted throughout Asia, about the level of exploitation, the excessive quantities of juvenile fish being taken out, and the impacts of demersal trawls on the seabed. The issue of fish unsuited for human consumption and used for aquafeed is significant. The inaugural meeting of stakeholders was held in July in Ben Tre, capital of Ben Tre Province. A preliminary evaluation of the fishery against the existing Responsible Sourcing standard of the International Fishmeal and Fish Oil Organisation (IFFO) was planned for December. Collected additional data for IFFO assessment of trawl fisheries in Kien Giang and Ben Tre provinces. Communicated actively with FIP stakeholders to encourage participation. Encouraged newcomers to join and collaborate with the FIPs in Vietnam. SFP organized an ALDI (UK, US, Australia, and Germany) visit to a fishmeal factory in Ben Tre. A roundtable meeting was held in Ben Tre in May. The participants included representatives from SFP, Sub-DECAFIREP, Uni-President, CP Vietnam, ALDI, and a local researcher. Sub-DECAFIREP committed to: support relevant stakeholders regarding providing fisheries management policy and information needed (if available); liaise with relevant stakeholders (fishers, middlemen) and support/collaborate with fishmeal processing/trade companies in traceability; develop and share provincial fisheries management plan with relevant stakeholders. CP Vietnam expressed interest in the FIPs in both Ben Tre and Kien Giang and committed to: contact/inform its fishmeal providers (inside Vietnam) to join the FIP; seek IFFO standards for fishmeal and fish oil. Participants agreed to have another stakeholders meeting in Ben Tre between July and August, after fisheries assessment reports were available. Received final reports of trawl fisheries assessments for Ben Tre and Kien Giang following IFFO-RS standards from IFFO. Continued communication with SFP and relevant stakeholders and participants for collective collaboration in implementing FIP projects. First draft of workplan for Ben Tre FIP developed by Morrisons, Sub-DECAFIREP, and Ben Tre Fisheries Association. Contacted the ASEAN FIP protocols (USAID) to integrate the Ben Tre and Kien Giang FIPs into that project. Communicated with CP Vietnam to invite them to get involved with the current FIPs in Vietnam. Ben Tre FIP roundtable meeting held, including participants from Kien Giang FIP, in Ho Chi Minh City, 6 October 2014. Shared experiences in development and implementation of FIP Ben Tre with Kien Giang FIP’s stakeholders; drafted roadmap for Kien Giang’s FIP. Proposed FIP roundtable meeting in Rach Gia (Kien Giang) on 19 November 2014 and arranged papers and logistics for that meeting. Organized visit by delegates of California Environmental Associates to Ben Tre; confirmed agenda for 10–11 November 2014. Assisted arrangements for representatives from ASEAN FIP/USAID to visit Ben Tre and Kien Giang, proposed itinerary for 24–26 November 2014. Prepared detailed workplan for implementation of trawl fisheries improvement in Ben Tre. In January, created a detailed workplan for the Ben Tre FIP and circulated to relevant stakeholders including retailers, seafood exporters, aquaculture feed producers, fishmeal processors. During January and February, met with Oxfam, ICAFIS (International Collaborating Centre for Aquaculture and Fisheries Sustainability), and Seafish to discuss ways to develop and integrate activities dealing with improvement of social issues relating to the Ben Tre FIP and application of RFS (Responsible Fishing Scheme). January 20–February 10, met with Oxfam, USAID, and Morrisons to discuss application of draft ASEAN FIP protocols in the Ben Tre FIP as a trial project. January 18–February 10, met with Pelagic Data Systems to investigate the possible use of their vessel monitoring systems (VMS) on board trawlers in Ben Tre. Planned for a March 2015 meeting in Ben Tre at which relevant current participants and stakeholders in the Ben Tre FIP can be introduced to Oxfam, ICAFIS, and Seafish. Meeting goals are to find gaps in the part of the workplan that deals with social issues and to make preliminary agreements on an action plan for some activities relating to social issues in fisheries.